Interested in what other community groups are doing across the UK and the rest of the world? Come along and socialise, be inspired, and kick some ideas around with us about what you’d like to see Transition Tavistock doing.over the next few years. Its been a while since we’ve invited you to join us for a film and discussion. 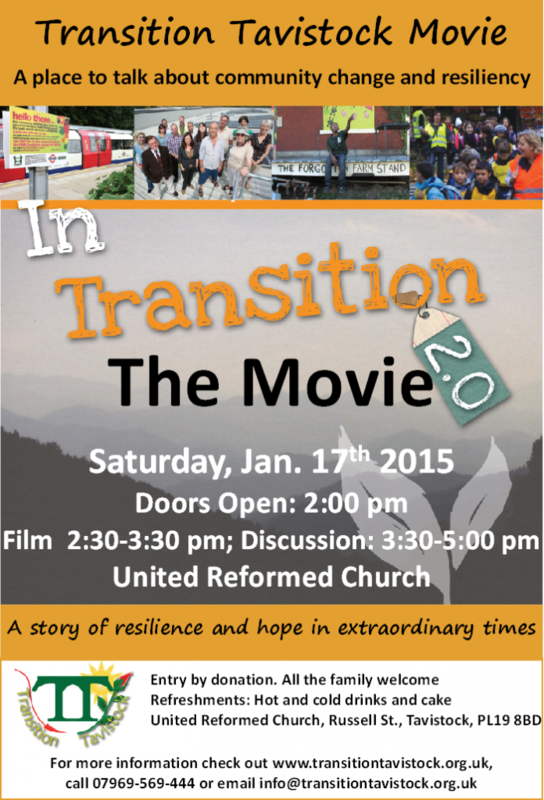 We’re showing ‘In Transition 2’ followed by an open discussion. Tea, coffee and delicious cake available. Register here (it’ll give us an idea of numbers) or just come along on the day.Download the poster here. Check out www.transitiontavistock.org.uk for more details closer to the date … or email (info@transitiontavistock.org.uk) or call us (07969-569-444). “In Transition 2.0: Gathering stories from around the world of ordinary people doing extraordinary things. You’ll hear about communities printing their own money, growing food everywhere, localising their economies and setting up community power stations. It’s … about responding to uncertain times with solutions and optimism. This entry was posted in Events/Meetings, News, Uncategorized on December 20, 2014 by Transition Tavistock. With Christmas nearly upon us … and the New Year approaching ,,, if you’re concerned about your energy bills and want to reduce your usage check out our Energy Saving Practical Measures. We’re here to offer independent advice and support. Get in touch if you have any questions or would like to have a chat. This entry was posted in Uncategorized on December 17, 2014 by Transition Tavistock. 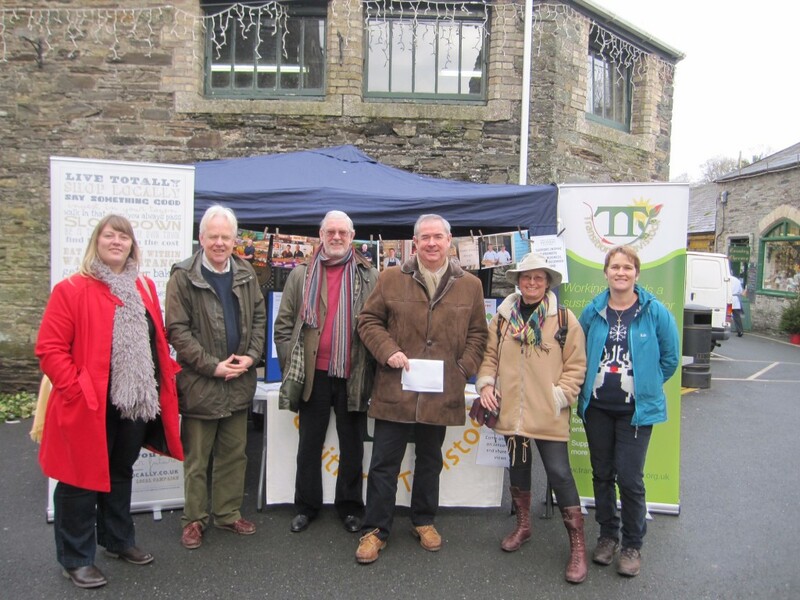 We celebrated Small Business Saturday (6th December) in Tavistock with a stall outside the pannier market. Organised by Transition Tavistock and Totally Locally Tavistock, and supported by FSB, we put on a display and promoted small business across Tavistock and its parishes. It was also an opportunity to promote the Tavistock and District Local Economic Blueprint. We met up with Geoffrey Cox MP, David Shepherd and Simon Earland from the Federation of Small Businesses (FSB), Lisa Piper (Tavistock BID) and Richard Searight (Peninsula Rail Group). It was a great chance to pilot our Blueprint questionnaire. If you’re involved in the local supply chains for food and drink, retrofit or local energy generation … or would like to be … or you’re a consumer who’d like to have a say then get in touch (info@transitiontavistock.org.uk; 07969569444). This entry was posted in Events/Meetings, News, Uncategorized on December 7, 2014 by Transition Tavistock. It’s Small Business Saturday on December 6th (https://smallbusinesssaturdayuk.com). A national day set up to support, inspire and promote small businesses on the 6th December and beyond. It’s also a good day to let you know about the Tavistock and District Local Economic Blueprint. A long name for a simple idea. With the support of West Devon Borough Council, we’re finding out how much people are, or could be, spending across the area (Tavistock and surrounding parishes) on food and drink, making our homes more energy efficient (retrofit) and local energy generation. We want to talk to local businesses and budding entrepreneurs and consumers working in or buying from the food and drink, retrofit and renewables sectors … and put in place a shared campaign to secure more business and independent businesses locally. Do we need more local skills training? Are we missing a particular type of local supplier? Could businesses be co-operating better to market local produce? Is more local investment needed? If you’re a farmer or producer, smallholder, brewing, baking, manufacturing, selling and/or serving food and drink, involved in the generation industry … or a builder, plumber, electrician, architect, selling bathroom or kitchens, insulation, energy efficiency lighting etc. … come along and join us in Bedford Square between 13:30 and 15:00 on Saturday December 6th and find out how you can get involved. We’ll also be joined by Geoffrey Cox QC MP who will be coming along at 13:45. The event is being supported by the West Devon Branch of the FSB and Totally Locally Tavistock. If you can’t make it then get in touch by emailing info@transitiontavistock.org.uk, call 07969-569-444 or check out www.transitiontavistock.org.uk. This entry was posted in Uncategorized on December 2, 2014 by Transition Tavistock.